Team Chat lets you quickly make decisions together with your team in real time from your phone or computer. You'll also have a real-time feed of the latest updates on your project on any device, and you'll be able to ping any team member when you need to talk to them. How Can You Use Team Chat? 1. How Can You Use Team Chat? 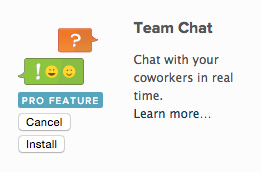 You can chat with your team members directly inside Planio, on desktop clients or on your mobile about a project. You can discuss an issue in chat, and your chat will be easily accessible from that issue, so you’ll have all the discussion around the issue in one place. You can ping people by writing their name, so you can quickly ask them a question. They’ll get a notification, so they’ll know about it straight away. You can search the entire chat log using search. Everybody can simply look up what has been said on a subject and absent people can catch up on past chats easily. 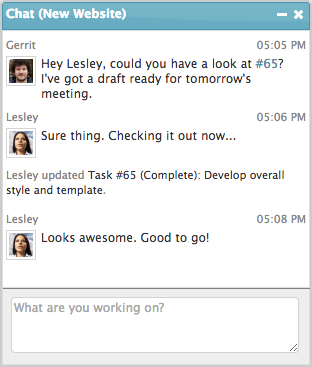 You'll see chat notifications on updates made within Planio. Log into your Planio account and select the project for which you want to enable team chat. Go to Apps in the navigation bar and make sure Team Chat is installed. It’s an optional extra, so you might have to upgrade to use it. Once installed, you’ll see a chat tab in the bottom-right of the screen. You can start chatting here. You'll also find Chat Logs in the navigation bar. Click on it, and you’ll see a history of all chat messages. On the right, you’ll see a sidebar with chat credentials. You’ll have to enter your account password to see the Server password. 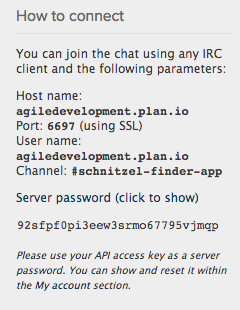 You’ll need these credentials to set up chat on mobile devices and desktop IRC clients.